After what seems like many long weeks – Maddie’s headband has finally gone the way of the dinosaur. This is the day her parents have been looking forward to for some time, and obviously so has Maddie. As the cranial technicians discussed the possibility of removing the band behind closed doors, Maddie’s anxiety and anticipation was off the charts. She demonstrated this by dousing me with three separate celebratory streams of spit up. Oh the fun of it all and the festivities were really just getting warmed up. Free from the burden of the headband, the baby also banished any thought of sleep. She blew off nap after nap – after all, who can sleep at a time like this? Finally I broke down and decided to take Maddie out for a walk. The first thing that jumped out at me was how much easier it is to change her clothes and put on a jacket without the massive headband in the way. This was a point of contention with Maddie ever since she first put the band on. It often led to fussy behavior and a little bit of pouting. So Maddie took her first walk outside in a long time without the protection of the headband. This was when things really got interesting. Multiple people kept coming up to Maddie and trying to get her to smile. We got stopped by three different groups of people who wanted us to hang out so they could say hi to her. Even with all the attention Maddie is getting, there is one distinct downside that we haven’t encountered yet. 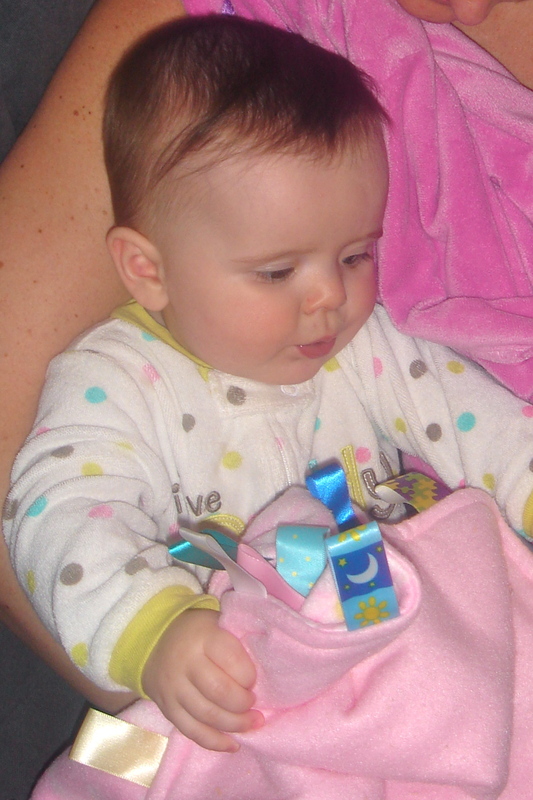 For months now, Maddie has been swinging various items around and knocking herself right in the head. The protective band has blunted these blows to the head time and time again. Maddie’s parents cringe at the thought of her having to learn the hard way not to knock herself in the cabeza. For now all we can do is hope for the best and pray that Maddie learns very quickly. This entry was posted in Anger Management, Child Development, Family, Parenting and tagged 200th Story, baby, DOC Headband, family, headband, Parenting. Bigger Threat: Maddie’s Nails or Wolverine’s Claws?